With eighth-generation Intel Core processors, MacBook Pro reaches new heights in compute performance. A quad‑core processor on the 13‑inch MacBook Pro with Touch Bar now makes it up to twice as fast as the previous generation. So when you’re powering through pro‑level processing jobs like compiling code, rendering 3D models, adding special effects, layering multiple tracks, or encoding video, you’ll get everything done. Faster. Introducing the Apple T2 chip — second‑generation custom Mac silicon designed by Apple to make MacBook Pro even more secure. 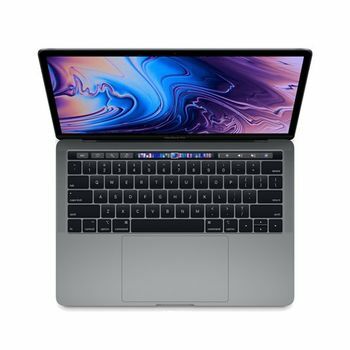 Featured on the 13inch models with Touch Bar, the Apple T2 chip includes a Secure Enclave coprocessor that provides the foundation for secure boot and encrypted storage capabilities. It also consolidates many discrete controllers, including the system management controller, audio controller, and SSD controller, into one. And the Apple T2 chip brings a familiar voice to MacBook Pro — Hey Siri is always ready to open apps, find documents, play music, or answer your questions. The MacBook Pro keyboard features a butterfly mechanism — providing four times more key stability than a traditional scissor mechanism, along with greater comfort. The 13 inch MacBook Pro models with Touch Bar now feature a keyboard with a quieter typing experience. And the spacious Force Touch trackpad gives your fingers plenty of room to gesture and click. Please allow 5-7 working days for deliveryMacBook Pro. More power. More performance. More pro. New eighth-generation Intel 6‑core and quad-core processors. Stunning Retina display with True Tone technology. Touch Bar for working more productively. Performance With great power comes great capability. MacBook Pro elevates the notebook to a whole new level of performance and portability. Wherever your ideas take you, you’ll get there faster than ever with high‑performance processors and memory, advanced graphics, blazing‑fast storage, and more. Processor More power at its cores. With eighth-generation Intel Core processors, MacBook Pro reaches new heights in compute performance. A quad‑core processor on the 13‑inch MacBook Pro with Touch Bar now makes it up to twice as fast as the previous generation. So when you’re powering through pro‑level processing jobs like compiling code, rendering 3D models, adding special effects, layering multiple tracks, or encoding video, you’ll get everything done. Faster. Blackmagic eGPU Desktop-class graphics without the desktop. Blackmagic Design has created an external GPU (eGPU) ideal for MacBook Pro. So you can have desktop-class graphics performance without giving up the portability of a notebook. Housed in an all‑in‑one aluminum enclosure, the Blackmagic eGPU is powerful yet quiet, charges your MacBook Pro using Thunderbolt 3, and has built-in I/O connections to drive both a Thunderbolt 3 display and VR accessories simultaneously. With the Blackmagic eGPU and MacBook Pro, you can accelerate pro apps, create VR content, and enjoy supersmooth gaming anywhere you roam. Apple T2 Chip The next generation of security. Introducing the Apple T2 chip — second‑generation custom Mac silicon designed by Apple to make MacBook Pro even more secure. Featured on the 13inch models with Touch Bar, the Apple T2 chip includes a Secure Enclave coprocessor that provides the foundation for secure boot and encrypted storage capabilities. It also consolidates many discrete controllers, including the system management controller, audio controller, and SSD controller, into one. And the Apple T2 chip brings a familiar voice to MacBook Pro — Hey Siri is always ready to open apps, find documents, play music, or answer your questions. Thunderbolt 3 The most powerful and versatile port ever. Thunderbolt 3 combines ultra‑high bandwidth with the ultra‑versatility of the USB‑C industry standard to create one revved‑up universal port. It integrates data transfer, charging, and video output in a single connector, delivering up to 40Gb/s of throughput for twice the bandwidth of Thunderbolt 2. Both sizes of MacBook Pro are available with up to four ports, so you can do all of that from either side. Existing devices are easily connected with a cable or adapter. And Thunderbolt 3 is reversible, so no matter how you plug in, it’s always right side up. Touch Bar More ways to be productive. Always within reach. The Touch Bar replaces the function keys that have long occupied the top of your keyboard with something much more versatile and capable. It changes automatically based on what you’re doing to show you relevant tools that are intuitive to use — system controls like volume and brightness, interactive ways to adjust or browse through content, and intelligent typing features like emoji and predictive text, just to name a few. Tap it. Hold it. Flick it. Slide it. Familiar gestures make it easy to use the Touch Bar. Tap to expand the Control Strip, flick to adjust volume and brightness, or slide to rewind while watching a movie. Just what you need. Right where you need it. Many of the built-in apps on your MacBook Pro have Touch Bar controls that make common actions like sending an email or formatting a document even easier. The Touch Bar changes to match the app you’re using, bringing these shortcuts front and center. And third-party apps can take advantage of the Touch Bar as well. Display and Audio Easy on the eyes. Music to your ears. The Retina display in MacBook Pro is the best ever in a Mac notebook. It features bright LED backlighting and a high contrast ratio, delivering deep blacks and bright whites. It supports P3 wide color for even more vibrant greens and reds than with sRGB. And the 13 inch models with Touch Bar feature True Tone technology. The white balance automatically adjusts to match the color temperature of the light around you — for a more natural viewing experience. MacBook Pro has beautifully balanced, high‑fidelity sound that takes listening to new levels with wide dynamic range and more bass for maximum boom. And the speakers are connected directly to system power, enabling greater peak amplification. So you can mix a track on the fly, edit video on location, or enjoy a movie on the go. Keyboard and Trackpad Your workspace just got quieter. The MacBook Pro keyboard features a butterfly mechanism — providing four times more key stability than a traditional scissor mechanism, along with greater comfort. The 13 inch MacBook Pro models with Touch Bar now feature a keyboard with a quieter typing experience. And the spacious Force Touch trackpad gives your fingers plenty of room to gesture and click.